A short, readable book that explains clearly and simply what the church is and why it really matters. Your church is a miracle. If you didn't know that, this book will help you understand why. New believers and old believers with conflicted feelings about the church will especially benefit. Read this excellent book to learn how to love Christ's people better and worship God more. This book about the church is a gift to the church. It's clear, winsome, and needed, reminding us of the great reality of the body of Christ called to live, worship, and minister together in his name until he comes. I'm grateful for this biblical call to remember who we are and what, by God's mercy, we get to be and do as his gathered people. We couldn't be more excited about this book. Especially in our day when people look for reasons to reject the church, this book is a necessary encouragement. Sam expertly engages readers with what the Bible says, and brings the truth home through with illustrations that stick with you. We're eager to see church members, ministers, and cross-cultural workers benefit from Why Bother With Church? Fits the series "Questions Christian Ask" well, and in a refreshing way lifts believers up to the right attitude to the church as the body of Christ meeting to worship our God of grace and love and to serve one another as the people of God. It doesn't hide the weaknesses of churches, but provides biblical wisdom to overcome what often spoils congregations. For all who are thinking about going back to church or those who have been upset and have left church, those who are going to church but are unhappy and even for those who are regular committed members of a church. I actually read this book to help me understand why Christians wouldn’t want to go to church, and found it very helpful. So really it’s a great book for everyone to read. Sam helpfully answers questions that either I have had or have heard asked about the subject of church. He does so with engaging clear language accessible to many. A great book to give to people especially those maybe starting out on the Christian life and thinking what's church all about. The book made me have a deeper love for the church. This book was suggested to me by a friend (who'd seen it but not actually read it) as I have been struggling with some aspects of church. This book was easy to read, and insightful, and really helped me adjust my thinking and remember what church is really about, as well as my responsibilities towards my local church. This book also acknowledges differences between denominations, which I found helpful. Definitely a book I think I'd read again, and recommend to friends. We seem to find ourselves in the company of many disillusioned Christians who no longer feel the need to be part of a regular, worshipping church fellowship and although every part of me knows this is not right, until reading this book found it hard to articulate exactly why - A great help for those struggling with church in this ever increasing consumerism society. Quick & easy reading too. In an age when even Christians are tempted to do their own thing, this book gives clear, biblical and compelling reasons why we need to bother with church. 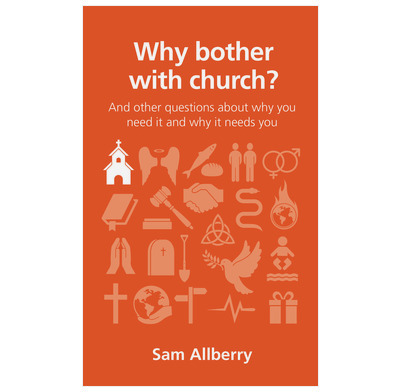 A succinct overview but with understanding of the questions people have about church. This short book is very timely. Without being unnecessarily theological, yet extremely biblical it meets a very real need. It is free from denominational bias and deals with differences fairly and impassively. It deserves to be widely circulated and should be a challenge to Christians who are not church members.